For branded sportswear and outdoor apparel companies, Freudenberg Performance Materials now offers the first padding made from fiber balls, which offers an innovative alternative to down. comfortemp® fiberball padding is a new, contemporary material for use as a warming intermediate layer in sports and functional garments. The high-performance, washable and fast-drying padding is very light and offers excellent insulation values as well as optimal breathability. This is because the fiber balls that give the product its name create a special pore structure. Other plus points include very high wearing comfort and an extremely soft and fluffy feel. The padding also impresses in terms of sustainability. In the comfortemp® fiberball eco version, it consists of 70% recycled polyester that is derived from post-consumer PET bottles. Although the fiber balls themselves are 100% recycled, binder fibers are used in the manufacturing process, resulting in a total of 70% recycled material. Small air pockets between the many fiber balls ensure a high, consistent thermal capacity. The particularly good insulation performance has been confirmed by an independent institute. For manufacturers, this advantage means that they can achieve the desired thermal value for their products with less material, i.e. with a lighter padding. Another important aspect in favor of choosing this innovative and ecologically valuable padding is that the material can be easily processed, just like a conventional padding. However, comfortemp® fiberball padding enables completely different possibilities in terms of design, since it does not slip or clump in the garment, as can happen with loose down. There is also no need for a fabric interlining, as is the case with down, because the padding is migration safe. Costs can be saved in the manufacturing and processing stages because they can be carried out more efficiently and with less energy. Very high resilience is another factor in favor of comfortemp® fiberball padding. The fibers do not stick together when a jacket sits crumpled up in a rucksack for an extended time period, for example, and they always return to their original shape. Thanks to this exceptional resilience, this innovative material can also be vacuum-packed, resulting in significantly lower transport costs because it can be shipped and stored much more compactly. Last but not least, comfortemp® fiberball also features an impressive price-performance ratio. Even the eco version for sustainable outerwear clothing is offered at a comparable price to conventionally produced alternatives. So it is not surprising that the innovative padding has hit a nerve within the industry. The specialists from Freudenberg Performance Materials invested almost four years in development work and the product is based on a completely transparent production and supply chain. The well-known Napapijri brand was closely involved throughout the development process. The PYUA label, a recycling pioneer in the textile industry, is also enthusiastic. Since 2008, the company from Kiel, Germany, has been producing sustainable, highly functional, pollution-free winter sportswear. That is why CEO Timo Perschke and his team immediately asked for an “organic version” at the market premiere of comfortemp® fiberball padding at ISPO 2017 in Munich. “So we resumed our research straight after the trade fair and developed the eco version at our headquarters in Weinheim in less than eight months”, explained Benoit Cugnet, Head of Global Strategic Marketing Apparel at Freudenberg Performance Materials. PYUA has an excellent reputation because the label optimally combines sustainability and functionality. In 2017, the company won the Federal Ecodesign Award, the Greentec Award and the ISPO Award – and in 2018, thanks to comfortemp® fiberball padding, PYUA was awarded an ISPO Gold Award in the “Snowsports – Mid Layer Hybrid” category. Our team of professionals will help you to find the perfect solution for your company. 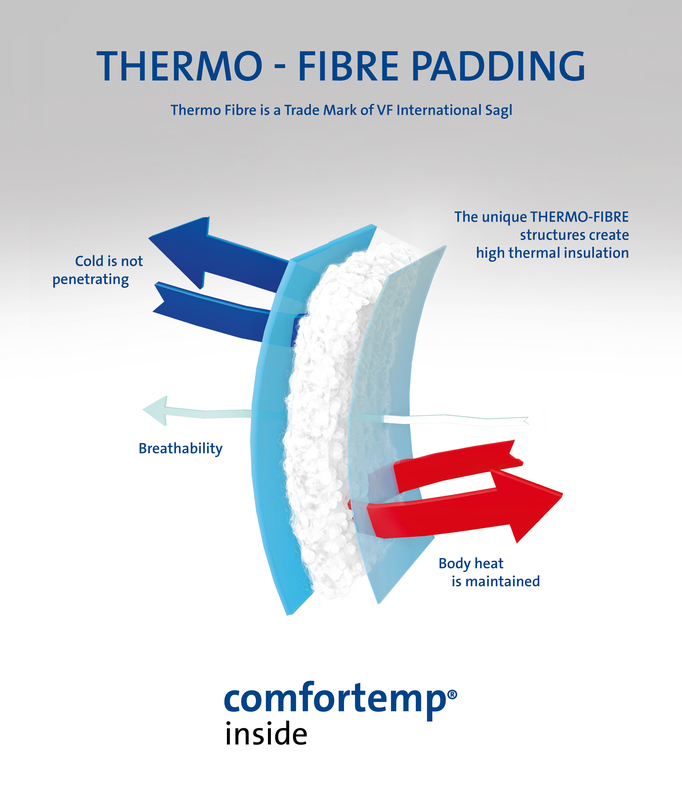 Do you have any questions about comfortemp® fiberball padding? Our team of experts will help you. Ready for the Olympic Winter Games? A pioneer in the textile industry meets Freudenberg’s innovation power. Our teamwork with PYUA has set new standards and demonstrates that highly functional outerwear and sustainability can go hand in hand. Read more about this topic in our news portal.